Bagan attracts many tourists with its incredible history and 2,200 beautiful temples and pagodas. Everyone is in search of the best photography spots and I must admit that you can’t get a better view over Bagan than from the top of one of the temples. Climbing these precious thirteen-century temples should definitely be limited for preservation purposes but unfortunately the government has decided to ban climbing on all Bagan temples. As much as I support the preservation of these incredible structures for the future generations, there is something undeniably appealing in finding a hidden Bagan temple and watching the sunset from the top of it, all by yourself or together with your loved one. To check out the must see temples in Bagan, click here. Before telling you exactly how you can find temples to climb in Bagan (even in 2019), let’s talk about safety and responsibility. There are a few things to keep in mind before deciding to climb on a temple or a pagoda in Bagan. First of all, you’ll have to take care about your own safety. Even though the temples have been restored, climbing on them holds potential risks. Second of all, keep in mind that it’s your responsibility not to damage the temples in any way. Check out the difference between temples, pagodas and stupas here. Note: Keep in mind that climbing temples in Bagan starting with 2018 is illegal and you are at your own risk. Even with the ban of temple climbing in Bagan, there are a few ways to find some temples that are still opened, even in 2019. Let’s explore the two options available. 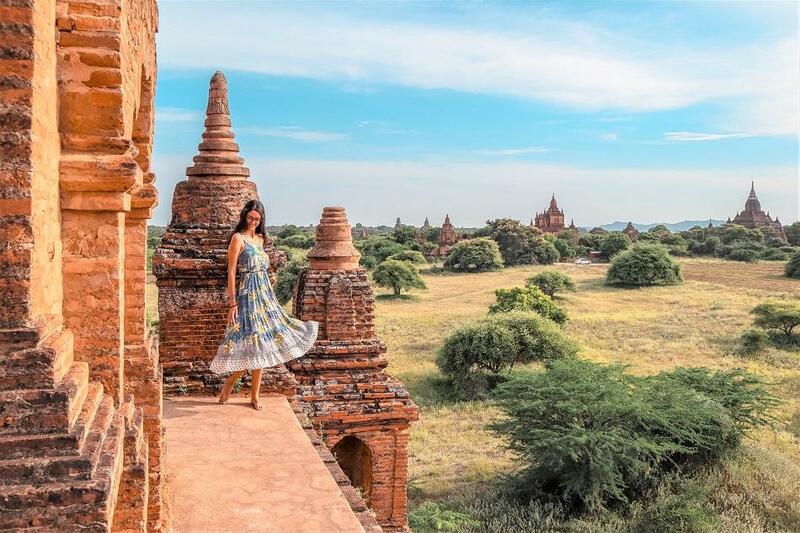 Check out the most beautiful temples in Bagan here. Now, this option is going to cost you a few bucks. Some locals in Bagan are searching all day for temples that are still opened. They wonder around from early morning until the late evening in search of tourists who are willing to pay a few dollars to find out which are the Bagan temples where climbing is still possible. You won’t have to search much for these people. Just drive around Bagan with your e-bike and you’ll most probably be approached by local people willing to sell you these kind of tips. Another possibility is to search for temples on your own. Yes, it’s going to take longer but the satisfaction will be bigger. First of all, don’t even try to climb on the big, famous temples. They are full of people and they are all closed. What you’ll want to do is find a hidden temple, away from the touristy areas and with a good view over Bagan. Take your e-bike (check out my full guide about renting e-bikes in Bagan) and start exploring the less touristy roads. When you see a temple where there are no people, get off our bike and check if it’s opened. If not, try the next one. Another alternative and, in my opinion, the best strategy to find Bagan temples to climb on is to take a ride around Bagan at sunset or sunrise. Hop on your e-bike, go to less touristy areas and look on top of the temples. If a temple is still opened, chances are somebody is already on the top enjoying the sunrise or the sunset. When you spot somebody on top of a temple, feel free to join! When did the ban happen? The temple climbing ban in Bagan was issued in the beginning of 2018. Locals have mixed feelings about the ban since they are afraid that it might have a negative impact on the tourism. Even though there is not yet any legal fine for climbing the temples in Bagan, the policemen are constantly checking that the temples are closed. If you don’t want to take any risks, you can still enjoy some amazing sunsets and sunrises from hot air balloons or from the man made hills in Bagan. These hills are the alternative provided by the government and they are not that bad (see the picture below). You will find them all around Bagan. On top of a man made hill in Bagan. 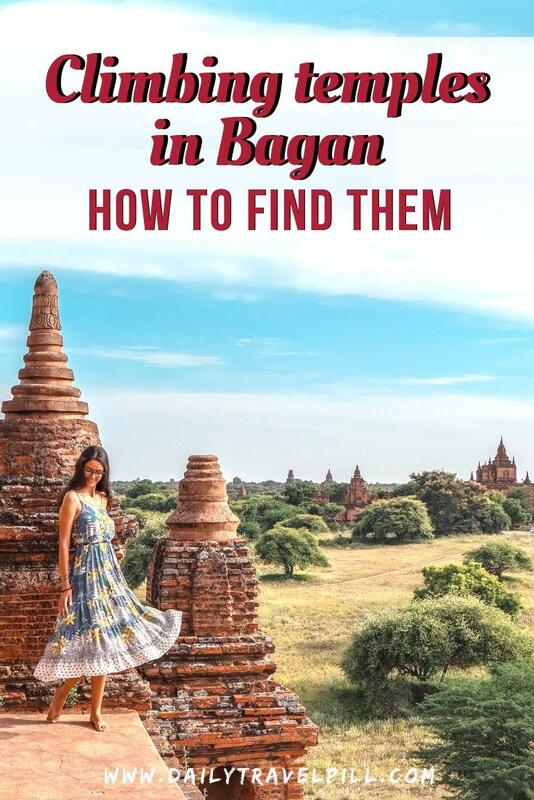 I hope that you’ve found this Bagan temple guide useful. For other interesting articles about Myanmar, check the list below. Also, I totally recommend the Lonely Planet guide about Myanmar. Here you will find useful tips & tricks and all the details you need for a perfect holiday.